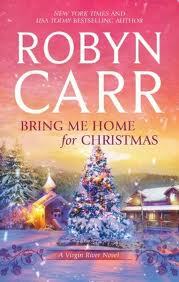 One of my favourite series to read is the Virgin River series from Robyn Carr, and I am not alone in loving it. I am sure I heard something somewhere which said that there was a community in America who have taken the idea of honouring the armed forces with the Christmas decorations on their town square and made it their own. The cutting of the Virgin River Christmas tree was an all-day affair that involved way more spectators than actual woodsmen. First, there was hunting for the tree - a thirty-foot fir high in the mountains. Becca watched from the truck the entire time. Then there was the cutting down. She would've expected that to take seconds, but it took a very long time and involved pulleys and ropes and chain saws. Next came the netting and dragging of the tree along barely visible old logging roads. Only big pickups with four-wheel-drive ventured back into the thickest part of the forest. Once the tree was dragged as far as a main road, a local builder, Paul Haggerty, and his crew met it with a big flatbed truck and their hydraulic gear to lift it and haul it the rest of the way. By the time the tree made it to Virgin River, it was dark, but half the town seemed to be present to look at the catch, so to speak. There was lots of "oohing" and "aahing" going on. On Saturday the tree was erected - a process that took many hands and more of Paul Haggerty's equipment and men. "The first time we brought a tree this size into town, it was just Jack, Preacher and Mike Valenzuela standing it up," Mel told Becca. "During the night, it fell down. Thankfully not on the bar." Becca sat on Jack's porch between Mel and Paige. They all held hot drinks. Her eyes grew large at the prospect of that huge tree falling on the bar. "Should we move?" she asked. Mel just laughed. "I think that now Paul's on board with this project, we're in pretty good hands. And I think your brother and his friends are kind of enjoying this. Too bad they won't see it completely decorated." "That must take a long time," Becca said. "A day or day and a half, and at least one cherry picker," Mel told her. It was past noon before that tree was upright and stable. Mel and Paige were back and forth to the porch, taking children in and outside. By afternoon, a couple of cherry pickers had arrived and the stringing of the lights commenced. Becca was surprised she wasn't frozen to the bone, but she couldn't stand to miss a second of this process. And neither could anyone else! Townsfolk came and went throughout the day, everyone with a new opinion about the tree. By then, night was falling, although it was only about five, and Jack and Denny were fastening up the last of the lights. Cars and trucks were pulling into town. Becca gave a wave to Noah Kincaid and his family. Connie and Ron walked across the street from The Corner Store. Lorraine Thickson arrived in a beat-up old pickup with a passel of kids stuffed into it. No husband and father, she noticed. Becca sat up a little straighter as she saw Denny in the cherry-picker basket, going up up up to the top of the huge tree. Mel and Paige came back outside; their kids ran into the street. Everyone seemed to sense that culmination was near. Denny fussed with the top of the tree, then the cherry picker lowered him to the ground again. Jack must have connected the electricity, because the tree came alive! Light twinkled all over the giant fir and on the very top was a star that positively brightened the sky! There was a collective "aww" in the crowd and as the night grew dark and the lights bright, there was silence. People seemed motionless. Then magic happened - a gentle snow began to fall. "Unbelievable," Becca whispered to no one. "Amazing." She felt her eyes water from the sheer beauty of the moment. Then the tree went dark and, after her eyes adjusted a bit, she noticed people beginning to disperse. Suddenly Denny was beside her, scooting his chair close. "You okay?" he asked. "Sure," she said, wiping at her eyes. "It was just so emotional - seeing all the work done and so many people turn out. "Its far from done. There are ornaments and trim still to do. The official lighting is tomorrow night, after the rest of it is decorated. It takes half the town to get it done." He grabbed her hand and squeezed it. "You're going to love it. Too bad the boys can't stay for that." And that tree - a town project - was awesome. Finally done, it was trimmed with red, white and blue balls, laminated military unit badges and strung with gold tinsel. It was gorgeous in daylight; it would be magnificent lit against the night sky. So, so different than the way we go about getting our trees nowadays! This is one of the series by this author that people been recommend to me. But I haven't read them yet. And I never read by this author before..so it new challenge for me :) Love the quotes from the book!